A self-taught artist of hand weaving, Jackie Haines began working with beads in the mid-90’s. 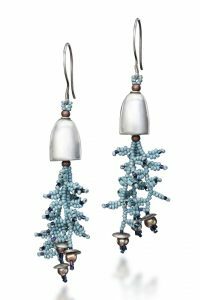 She weaves with wire and single-facet ‘true cut’ beads to create a faceted sequin-like form. Jackie later discovered precious metal clay (PMC), which she uses to mold unique sculptural forms, often reminiscent of her studies in botany and horticulture. Jackie currently resides in Lamoine, Maine, where she works and continues to garden in her spare time. 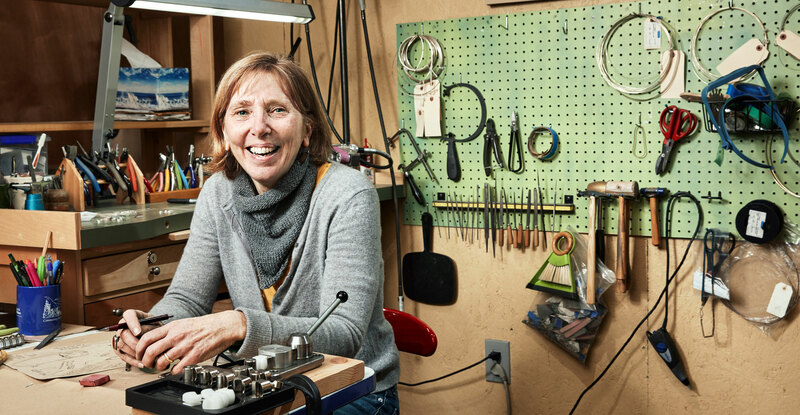 The MCA was recently honored to include Jackie Haines in the Artists in their Studios Photography Project, where photographer Michael Wilson captured Jackie in her jewelry-making element in her barn-turned-studio. Jackie’s work can be found online here and at the Center for Maine Craft.